Now that's it's officially the last week of July and The Fireman Readalong, I think it's safe to write my final thoughts on the book. There is a contagious fungus that causes spontaneous combustion in the human carriers. This contagion is spreading all over the world, with the added bonus of burning down just about everything. Harper is a nurse in New Hampshire, trying to help as many people as she can. A difficult task since with the whole world in a panic and entering Mad Max territory. People with the contagion are being rounded up and sent off to death camps. Or worse, murdered by vigilantes who see sick people as murderous criminals. Inevitably, Harper catches the pox, er, fungus and with the help of the Fireman escapes to a utopian abandoned summer camp inhabited by other sick refugees. But we all know what happens to utopias. Eventually they become dystopias. I dunno. I liked The Fireman but didn't love it. It was a quick read. There were periods of action between long periods of people doing nothing. I had to push myself through those sections to get to the interesting bits. It's a book that's 750 pages and could have been cut down to a more reasonable size. It's not like we got some intense character studies during these slow bits. Nobody seems all that deep. Speaking of shallow characters. Jakob is a one dimensional guy. He really ends up being a cartoonish woman hater. He very quickly becomes a murderer and shows no affection for his wife or their unborn child. He was too much. The Cremation Crew he hangs around with are just a bunch of guys who probably troll feminist websites in life before the plague. Women are front and center in this novel. They aren't damsels and can take care of themselves in this terrible world. The fisherman. He might be my favorite character. Maybe it's because he is the quintessential East Coast older man. Rough around the edges, but kind at heart. The lady in her forties got a love interest! The whole idea of Dragonscale. It's a plague unlike any I've read in books before. It's beautiful, but deadly. All the pop culture references. I'm not a fan of too many references in a book (Ready Player One). I suspect it will date this book. Not sure how I feel about the ending. It's hopeful, but also everything leading up to it is pretty crappy. The title. 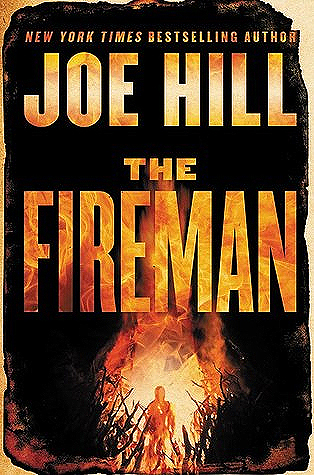 I get that the Fireman is a mythological being to outsiders, but I'm not sure why he's the namesake of this book. Then again, I'm not sure what I would title it. So, kind of a mixed bag of feelings on The Fireman. Hey Readalongers! I'd love to discuss this more with you. Leave comments and questions in the comments section. I do love pop references but don't know if I want to slog through the dull parts to get to the action. I'm struggling with the pop culture references. I do love the book so far, but it's still fairly early for me. We'll see how it all shakes out! Your review has me kind of unsure about this one. I will probably get to it sooner rather than later since it's on my nightstand, but I usually have to be in the mood to read a book that long. I agree with your comments, but I think I liked it more. Both 40ish women got love interests! Other good things are the reading references - it's a book for book lovers. I made a list of all the books mentioned; I think I got all of them. I still can't believe how fast I read it. I'm with you on this one. I loved a few of the things you mentioned, love interest for a 40-something, and Dragonscale was beautiful! I felt like a few of the characters were a bit too cliche. Still a fun read!